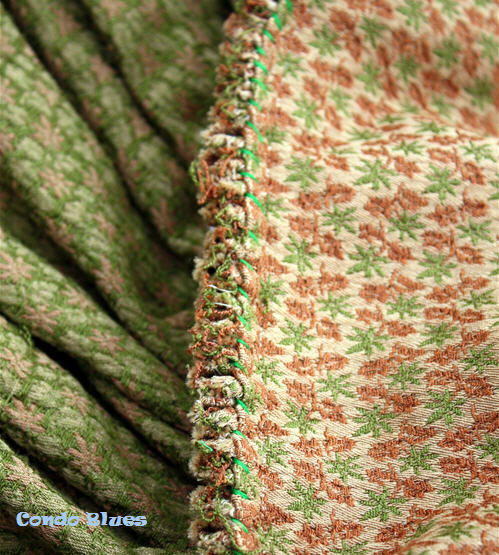 Condo Blues: How to Sew Cartridge Pleats the Easy Way! 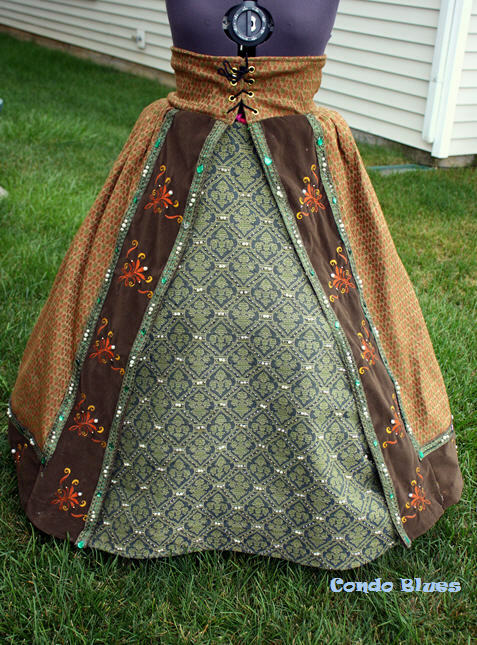 I’ve made many curtains for past homes but it wasn’t until I started building Elizabethan Renaissance costumes that I learned how to sew cartridge pleats for curtains by using the same technique to make cartridge (also called gauge or gauging) pleat skirts! Back in merry old Elizabethan England - way before they had central heating - nobility used heavy fabrics similar to our modern upholstery weight fabrics to make clothing. Dresses had voluminous skirts, small waistbands, and the illusion of large child bearing hips were all the rage. Pin this sewing tutorial for later! Tudor women were the original Fat Bottomed Girls! It also makes your princess dress super swishy which is always fun when dancing! 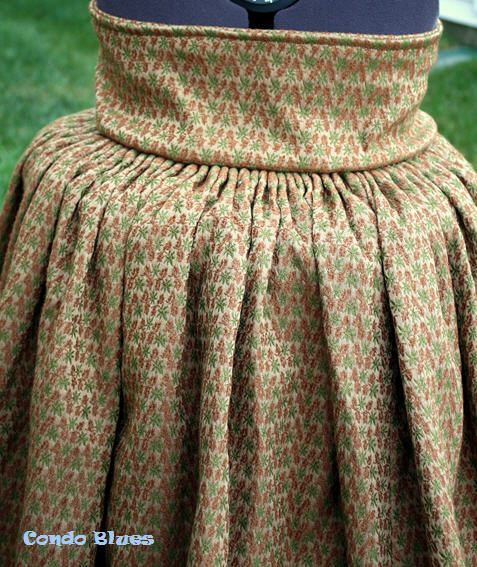 Historical sewing purists say you must hand sew three to four rows of long stitches the width of the skirt and pull the threads to make cartridge pleats. I’ve done it that way. 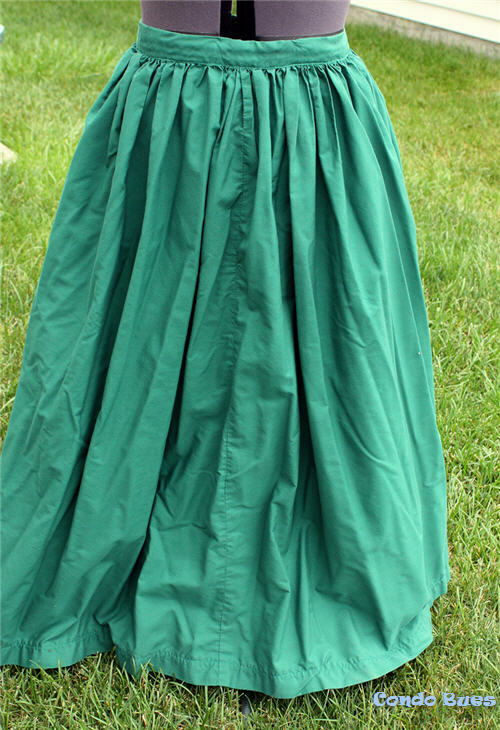 It takes foooooooooreeeeeveeeeeeeer to hand cartridge pleat a skirt like the one shown in this tutorial. After spending and entire Saturday and well into Sunday hand sewing cartridge pleats on my first Elizabethan noble dress project, my timeline and aching back needed an easier and quicker way to sew cartridge pleats into historical skirts and dresses. I started to get historical clothing orders after my first dress project was shown in an Ohio State University art exhibit. I never considered myself an artist because I don't like the way I draw. The curator said I was an artist but my medium is needle and thread. Aw, shucks! 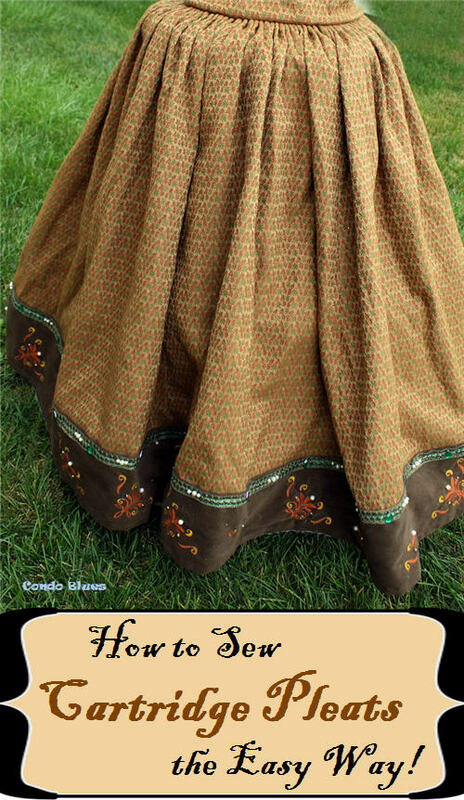 Skirt fabric sewn together – I’m using sewing pattern Butterick P413 backwards to make my Elizabethan over skirt skirt but you can use any pattern you like. This is what the pattern looks like when you follow the directions to make a gathered skirt with a wast band that buttons closed in the back to make a peasant's skirt (that's why I don't iron it.). This example also allows you to see the difference between a cartridge pleat and a gathered pleat skirt. Disclosure: I am including affiliate links to my supply sources for your convenience. 1. Use the straight pins to pin the cartridge pleat tape to the top of the skirt and where the waistband will meet. 2. 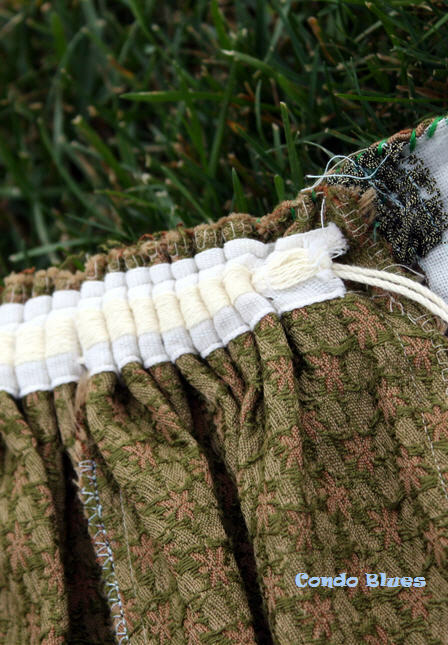 Use the sewing machine and coordinating thread to sew the curtain pleat tape to the skirt. 3. Knot the cords at one end of the cartridge pleat tape together. 4. Pull the cords on the other end of the cartridge pleat tape so the fabric starts to fold into deep accordion pleats until it is of a size that fits the waistband of the skirt, and knot the cords together to keep the pleats in place. I am petite and do not want wear deep gauging in this skirt.If you want to make deeper cartridge pleats than the pleats in this tutorial, line up two pieces of curtain pleat tape one on top of the other. 5. Pin the waist band to the skirt. 6. Use the heavy duty thread and needle to whip stitch the top of each pleat to the waist band with several stitches per pleat. I am making this waistband ridiculously high so it acts as modesty panels for the side spiral lacing of my bodice when I raise my arms for dancing and riding. Since the pleating on an Elizabethan princess dress starts at approximately the hip bones. I cartridge pleat the skirt first. I machine embroidered the trim and added it to the front and bottom the skirt afterward. Originally, I didn’t hide the seams with trim because I wanted the embroidery to stand out on its own. I felt a little plain to me but I was stumped since I said I want this dress to look different than the other noble ladies in Queen Elizabeth's court. I did what any sane person who is out of ideas would do - I asked the Internet for help! 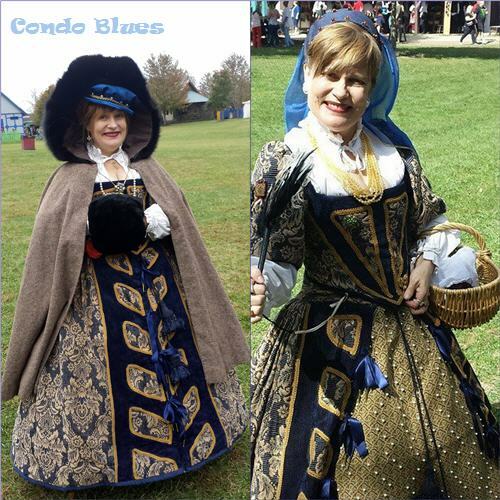 Follow me @condoblues on Instagram to see project sneak peeks like this one in real time! To move the dress more toward to the Diva-liciousness I envisioned, I layered gold metal trim over green satin ribbon where the velvet and brocade meet. 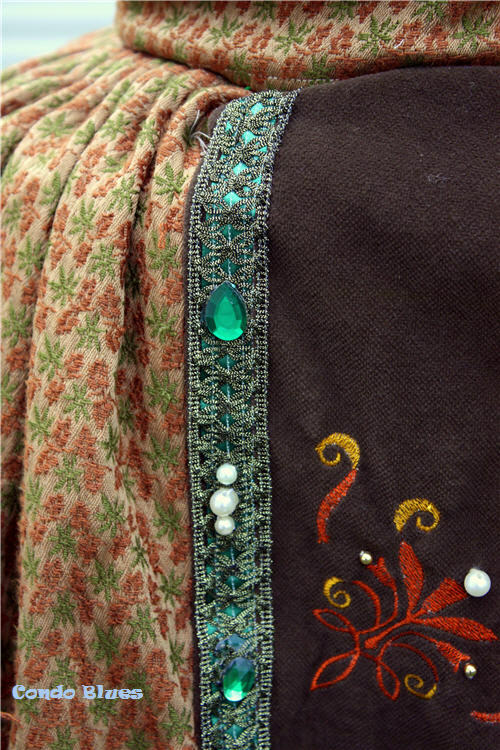 I hand sewed pearls from my stash and “emeralds” to the gold trim to kick it up a notch in the right direction. I’m not entirely happy with the jewels because they look stuck on. What do you think?